Humanities Center has scheduled talks to be held during the Fall and Winter semesters. These talks are held mainly on Tuesday and Wednesday, but occasionally on other weekdays as well. All lectures will be held in 2339 FAB from 12:30 - 1:30 unless otherwise announced. Since the inception of the weekly Brown Bag Colloquium Series, literally hundreds of Wayne State humanities and arts faculty and students have participated either as speakers or as members of the audience. Each new year brings an increase in the number of faculty volunteering to present talks. As a result, the Center regularly hosts talks twice a week throughout the academic year. Brown Bag talks are free and open to the public. We are inviting junior and senior scholars in the humanities and arts as well as those working in the natural and social sciences whose work overlaps with the humanities. Abstract: This project investigates a previously unexamined source of international law on armed conflict: resolutions of the United Nations Security Council Since the end of the Cold War, the Security Council has taken action on virtually every new armed conflict NIAC and on many that began prior to 1990. These actions are wide ranging. Each act is embodied in a resolution, which frequently imposes binding legal obligations on parties to the conflicts. The project asks two questions about this now substantial body of Security Council practice. The first is whether the Council has consistently imposed the same obligations over time. In order to answer this question we have created a new dataset that codes all Council resolutions on a list of conflicts ongoing from 1990 to 2013. The resolutions are coded for their imposition of binding obligations on a range of legal issues, from human rights to the law of armed conflict to the permissibility of using force. The data reveals that the Council in fact consistently requires the same acts. More importantly, many of these Council-imposed obligations differ in significant respects from what international law would otherwise require. Second, the project asks whether these patterns of obligations can contribute to or indeed change existing international law. We ask whether they can be assimilated into several categories of traditional legal sources or whether they should properly be viewed as ancillary to the law-making process but nonetheless relevant. Abstract: Gilles Deleuze's two-volume Cinema book provides a typology of cinematic images. The first volume concerns what Deleuze calls the movement-image in traditional cinema: the way motion and action are central to films from cinema's first half-century. The second volume concerns the time-image, as it is manifested in films from World War II up to the time that Deleuze was writing (the 1980s). In these films, time disengages from action and movement and becomes a new basis for cinematic form in its own right. My presentation considers what has happened to cinematic forms post-Deleuze. My argument is that a new cinematic form is emerging today, as digital technology becomes ubiquitous in audiovisual production, and as we move away from Foucault's disciplinary society to what Deleuze called the control society. These new conditions cry out for a third volume of Deleuze's Cinema, one that he never lived to write. In the world of what I am calling the rhythm-image, we encounter new articulations of time and space, and new relations between sound and image. Abstract: In this lecture, we will learn about the current state of computer music. The integration of computer in music has revolutionized the way we compose, perform, and listen. For example, the computer codes and mathematical models are being used in composition. New electronic instruments are used on stage to extend the limit of traditional performance practices. These technological advances in music are rapidly changing our concept and aesthetics of music. This talk is Co-sponsored with the Music Department. Abstract: Abstract: Obamacare, The Patient Protection and Affordable Care Act (ACA), was signed into law in 2010. It was designed to address the problems of the uninsured, cost of care, gaps in government programs, and inequality in health care. It has survived partisan opposition, and two Supreme Court challenges. Six years after passage, we address the myths of Obamacare and its realities. Has the ACA been a "job killer?" Has the ACA improved the American health care system? The presentation focuses on the decline in the number of uninsured Americans, the expansion of Medicaid by selected states, the ACA's impact on the access to care, the cost of medical care, and the public's satisfaction with ACA. Abstract: This paper is part from a broader project on Black Leninism, which examines black engagement with the ideas and example of Vladimir Lenin. It focuses in particular on questions of political organization: how to bring together oppressed persons in solidarity as an energetic, hopeful, and demanding collective, which then engages in transformative political action. Here, I focus on Langston Hughes, and his engagement with the simultaneously political and poetic problem of representing a black collectivity, and representing it first of all to itself (rather than to a white or "general" public). As he put it in I Wonder as I Wander: "I wrote about Negroes, and primarily for Negroes." I examine the shape this project took in the 1920s and 1930s, as Hughes moved from a poetics oriented around the blues to writing more explicitly communist, propagandistic poetry. What particular forms and modes did Hughes bring to the politically charged poetic project of representing a black collectivity to itself? In answering this question I hope to suggest that Hughes's poetry speaks not only to fundamental questions in African-American letters concerning the political import of black writing, but also to basic questions in the Marxist tradition about the role of representation and aesthetic experience in the creation of a revolutionary "class-for-itself." In so doing, I also hope to make a case for the continuing relevance of Hughes's poetry to the present moment, when the representation of black lives remains a vital political and poetic task, as the #blacklivesmatter movement and the protests in Ferguson, Baltimore, New York and elsewhere have dramatized so vividly. Abstract: Sexually transmitted diseases and HIV are pressing concerns for young people in contemporary China, as in many low-and-middle-income countries. Researchers and social advocacy groups recognize the urgency for increased access to sexual health education and services to reduce STD incidence and increase HIV testing. This paper presents one community based organization (CBO) implemented health campaigns through collaborations with hospitals, provincial and city level CDCs, Chinese CBOs, universities, student organizations, international public health experts, and social media venues. I do so by highlighting how medical anthropology/sociology facilitates the creation of community cohesion as we develop and apply interventions to improve sexual health in China. Key contributions made include analysis on the rise of civil society, the link between neoliberalism and the widening availability of medical care and sexual health information, and the increasing role of the individuality in health-seeking behavior in social relationships. While many interventions are individual-based, a CBO works with external stake-holders to build community-level awareness to support social shifts in visions and resources. Key examples of achieved milestones for improving sexual health and HIV/AIDS awareness include peer-agency meetings, joint-reporting across multiple external stake holders at community friendly venues, and participatory planning meetings to design and implement open participatory contests to solicit for images, sexual health awareness-promotion videos, and our health forum for medical students and local community health activists and scholars. The collective target is to gather organizations, experts, and students to discuss their sexual health concerns and develop opportunities for even greater social change. Abstract: Communitarian theory attempts to strike a reasonable balance between individual rights and the collective good. Communitarians believe that even in a rights-conscious society, rights have limits, and involve concomitant responsibilities. While constitutional litigation often involves a contest between individual rights and a sense of the collective good, communitarians bring to the table additional issues reflecting the multi-layered composition of our country: Are there some rights or responsibilities that can be claimed and exercised appropriately by intermediate communities, such as neighborhoods, political groups, corporations, and associations? Must we inevitably be locked into a binary choice between individual rights and government power? Should the law be more conscious of responsibilities owed by individuals, communities, or the state? In this paper, I will try to explain why our nation and its citizens may be served by employing a communitarian philosophy in constitutional adjudication. In a diverse country formed by people from many cultures who do not subscribe to a single religion, and enriched by multiple layers of communities, we are best served by a fundamental law that establishes and nourishes republican institutions, balances individual rights with the public welfare, and allows a community of communities to flourish. Abstract: The year of 2016 is important for black politics in the United States. The year represents the last year of the presidency of Barack Obama. President Obama served eight years in office. The year of 2016 also represents the 50th anniversary of the birth of the Black Panther Party in Oakland, CA. The BPP formally ended in 1982. This paper will discuss the impact of President Obama and the Black Panther Party on African Americans, the United States, and the world. President Obama became a symbol of political progress for blacks in the U.S. and around the world. His policies (foreign and domestic) are more controversial. His supporters maintain that he did the best he could for Americans and African Americans despite conservative opposition in Congress. As a result, President Obama was not able to achieve all his goals. The president's critics claim that his race neutral approach to running for office and governing prevented him from addressing the traditional black political agenda which focuses on reducing racial inequality and racial discrimination and increasing black employment, education, and health opportunities. Consequently, blacks continue to lag behind whites on traditional socio-economic and political indicators. The BPP survives as a powerful symbol of black resistance to oppression and the fight for black liberation. This essay will also examine the relationship between President Obama and the BPP and their distinct approaches to politics. Abstract: The Wayne State University HIGH Program which stands for 'Helping Individuals Go Higher', was first established in 2013 with the mission to ensure that no student abandons their dream of earning a degree solely because of housing or financial challenges. The program is designed to assist students in crisis who have exhausted all other funding options, and for whom homelessness is imminent without intervention. The HIGH Program provides short-term bridge funding to enable a student in crisis to get back on track. Out funding strategy focusses on filling agap. Since the program's inception, the HIGH Program has receive3d over 300 application for assistance and has helped over 130 students with financial support or direct referrals to an alternative funding source. The HIGH Program has a goal of supporting atleast 50 students per year. Without the support of our generous donors, the HIGH Program would not be possible. Abstract: In order to confirm himself as the next king, Shakespeare's eponymous hero, Richard III, reconfigures the history of his family to create a self-serving cultural memory of England's past. He constructs a series of narratives that represent not historical facts of personal and family identity but fictions he invents to get the power he feels is owed him. Then, Richard imposes his fiction of the past. In that transaction, characters are separated from what they believe and value and from their capacity to make sense of things. His strategic interactions elicit their guarded weaknesses and he is able, thus, to instill fear in them, deconstructing their memory of events with his truth claims. They are left reeling in doubt and fear, and are, in a word, terrorized. His narratives lead to his conspiring in acts of remorseless carnage, acts that immobilize England's governing officials and ecclesiastical leaders as the country plummets toward chaos. Abstract: The number of public corporations in the United States has been in decline for almost twenty years. Alternative forms of organization, from LLCs and benefit corporations to Linux and Wikipedia, provide robust competition to traditional corporations, while short-lived, project-based enterprises that assemble supply chains from available parts are increasingly cost effective. Yet our understanding of corporate governance has not kept pace with the new organization of the economy and we continue to treat the public corporation with dispersed ownership as the default form of doing business. Meanwhile, many of the corporations going public in recent years have abandoned traditional standards of corporate governance and give their founders extraordinary voting shares that effectively guarantee their control in perpetuity. The public corporation seems to be an increasingly anachronistic form of enterprise in the United States. Nikefication turned the corporation into a nexus-of-contracts, organizationally separating design from production and distribution. Entrepreneurs grew skilled at assembling contractors into a virtual enterprise. More recently we have seen Uberization, which allows on-demand labor to be contracted by the task via online platforms. Uberization threatens to turn jobs into tasks, to the detriment of labor. Every input into the enterprise becomes possible to rent rather than to buy, and employee-free organizations are increasingly feasible. Enterprises increasingly resemble a web page, a set of calls on resources that are assembled on demand to create a coherent performance. Abstract: What would make you happy? Getting a raise? Finding the perfect job? Taking an exotic vacation? If you got what you wanted most, would you live 'happily ever after'? Psychological research suggests that theses boosts in happiness are fleeting. Instead of experiencing a lasting increase in happiness in lieu of accomplishments or luxuries humans often adapt to their new circumstances, returning to a baseline level of subjective wellbeing, a process referred to as hedonic adaptation or the hedonic treadmill. This poses problems for conventional utilitarianism, a moral theory that equates the good with the maximization of happiness or wellbeing. If baseline happiness is relatively immune to actions, for better or worse, how can utilitarianism justify everyday normative claims on the grounds that they maximize happiness? This talk explores this question, with the hopes of resolving the tension between the hedonic treadmill and utilitarianism. Abstract: Although polar opposites in most respects, ideologically, politically, and socially, the counter-revolutionary Edmund Burke and the "Jacobin" John Thelwall in the 1790s both used an emotionally associative rhetorical style informed by fantasies of revolution. Their rhetoric can be read in terms of the unconscious associations with the revolutionary ideals of fraternity, equality, and liberty. At the center of the psychohistory of the revolution are regicide and tyrannicide, topoi in literary discourse from classical antiquity to Shakespeare and Milton. As fantasy, killing the king connects affectively with patricide, and if we follow Darwin and Freud, phylogenetic memories of the primal horde killing the tyrannical patriarch. The fantasy gives rise to an ambivalent reaction, an ecstatic liberation of desire and a sensation of freedom from paternal constraint, but also guilt and fear of the patriarch's ghostly, violent return (Lacan, Seminar VII). Although the distinction between tyrannicide and regicide shapes the political discourse, king-killing as such is psychologically provocative in terms of hope and anxiety. Abstract: Service-learning is a pedagogy where "students participate in mutually identified service activities that benefit the community, and reflect on the service activity in such a way as to gain further understanding of course content?" (Bringle & Hatcher, 1996, p. 221). Most service-learning literature emphasizes cognitive reflection but many students also need opportunities for emotional processing of service-learning experiences (Kiely, 2005). Our presentation explores the role of visual art making to aid reflection and integrate the emotions experienced in service-learning through the perspectives of four graduate art therapy students who participated in service-learning and reflective art making in an introductory art therapy class. The four students later used art based research methods (Rolling, 2013) to systematically examine their art processes and products and how these contributed to, or otherwise informed the meaning of service-learning to their art therapy education and practice. This presentation describes the service-learning assignment and art reflections, the art based research methods used to study how art processes and products contributed to students' learning, and recommendations for using art reflections in service-learning. Abstract: Using fifteen national and regional surveys collected between 1961 and 2010, the present study indicates that while African Americans are more likely than Whites to hear sermons about political issues, hearing such sermons more consistently associates with Whites taking progressive positions on policies aimed at promoting; human rights and economic opportunities in the US and abroad, fostering diplomatic relationships with other nations, and a criminal justice system that does not disproportionately burden and punish the poor and powerless than is the case among Blacks and Hispanics. For Whites, these political worship spaces may allow for a counter-narrative to a civil religious impulse that rationalizes an American Exceptionalism that calls for social and racial inequality and US global hegemony to ensure a safe world. Conversely, for Blacks and Hispanics, the experience of marginalization due to race, citizenship, and poverty-status may serve as a counter-narrative itself to such a civil religious impulse, which therefore, render mute the influence of political sermons on public opinion. "Intimacy and Sexuality in Luisa Valenzuela's Black Novel with Argentines and Diaries of New York." Abstract: The purpose of my talk is the analysis of some texts of the Argentine writer Luisa Valenzuela (Buenos Aires, 1939) focused on the notions of intimacy and sexuality. I will combine literary criticism and psychoanalysis, from Freud to Leo Bersani and other contemporary theorists, in order to explore not only the behavior of Valenzuela's fictional characters but also the representation of her personal life narrated as auto-fiction (according to the definition of Serge Doubrovsly). Intimacy is a fundamental human need but many factors inhibit this capacity. The capacity for intimacy develops from the matrix of the mother-infant relationship with its initial symbiotic phase to the subsequent separation-individuation process. Without proper passage through this process, fears of engulfment and abandonment will stifle intimacy. In Valenzuela's narrative, especially in Black Novel with Argentines and in her Diaries of New York, personal conflicts are fictionalized and represented in her characters or in her fictionalized alter ego putting into evidence the thorny nature of human intimacy (as in Schopenhauer' fable about porcupines often quoted by Freud). Abstract: The Motor City's tumultuous times have been looked at nationally through an exterior lens, but very little has been emphasized about how the continual loss of community affected the city. Through erasing the blight through urban renewal, race rebellions, and a devastating recession, the Detroit community continually are forced to rebuild. The Detroit Projects is a 3-play cycle by Dominique Morisseau that depict three eras in Detroit that were critical in changing the landscape of the city. They explore a variety of forms of experiences that are unique to Detroit, but continues to explore the sense of community versus the continual loss of community. Paradise Blue (1949) shines light on the challenges of building a better future of what our predecessors have left us. Detroit '67 looks at the explosive and unstable days of the 1967 rebellion. Skeleton Crew (2008) depicts four auto workers facing an uncertain future as the city edges toward the 2008 recession. This presentation will explore Detroit's sense of community versus a loss in community through Dominique Morriseau's 3-play cycle. Abstract: William H. Anderson (1857-1916) is a little known Detroit novelist who moved here at age 16. After graduating from Detroit High School in 1875, he went to work as a bookkeeper for the Newcomb & Endicott department store. He spent his free time writing, and in May 1883 he along with four other men published the first issue of Detroit's first black newspaper, The Detroit Plaindealer. In addition to his newspaper articles, he also wrote fiction, and with Walter Stowers published a 371 page novel, The Appointed: An American Novel (Detroit: 1894) under the pseudonym 'Sanda.' The plot, moving from Belle Isle north to Mackinaw Island and south to New Orleans and Birmingham and replete with references to American literary culture, (classical and modern), is a study of a friendship between two young men (one black, the other white) in 19th century America. My paper will examine Anderson's life and work. Abstract: In the period between the Mexican and Cuban Revolutions, U.S. folklorists, political radicals, writers, and artists traveled to and wrote about Latin America. This paper explores the cultural politics of what I call "latinophilia," my term for the mid-20th century enthusiasm for Latin America as a source of revitalizing energy for a United States withering under the tyrannies of mass culture and the grey flannel suit. I explore the dynamics of latinophilia in two of the best known American fictional engagements with 20th-century Latin America?Jack Kerouac's On the Road and Ernest Hemingway's The Old Man and the Sea. One of these dynamics, I argue, is the tautology. In On the Road, when the novel's protagonist Sal drives across the border at Laredo, Texas, he shares this insight: "Just across the street Mexico began?To our amazement, it looked exactly like Mexico." Development, as the name for a process and that process's endpoint, also conforms to the model of a tautology: a circular argument that returns you where you started. Sal's tautology expresses the complacency of the comfortable tourist, who confirms exactly what he already thought he knew about the foreign. But what he sees in the "foreign" culture also circles back to himself. And while these novels exemplify U.S. exceptionalism, their tautological structure ends up questioning the distance--cultural, geographic, and otherwise--between the "underdeveloped" and "us." Abstract: Since its inception in 1844 in Iran, the followers of the Baha'i Faith in Iran have been subjected to various forms of harassment in that country. Regardless of political regime, the Baha'i community fails to be recognized in Iran even though it makes up the largest non-Muslim minority in Iran. This systematic denial of basic human rights in Iran to its Baha'i citizens continues this historical pattern by the combined forces of "church" and state in contemporary Iran today. Recently, the Iranian office of Public Properties closed stores owned by Baha'is because they were closing their shops during Baha'i Holy Day festivities. On Sept. 30, 2016, 14 Baha'is were arrested by the security services in Shiraz in their private homes on unknown charges and their whereabouts are still unknown. Currently members of the Baha'i Faith in Iran are denied entrance to higher education. Members of the Baha'i Faith are banned from attending all Iranian universities. Eighty-one universities were recently instructed by the Iranian Ministry of Science, Research and Technology to expel any student who is known to be a Baha'i. The US House of Representatives has again recently passed in a completely bi-partisan manner, a resolution to address the systematic discrimination and harassment of members of the Baha'i Faith by the Government of Iran. The resolution calls on the President and Secretary of State, together with responsible nations, to condemn the persecution of the Baha'is in Iran and to demand the release of religious prisoners, including seven Baha'i leaders who have been sentenced to 20 years in prison solely on account of their religious beliefs. November 15 - Kevin Deegan-Krause, Political Science, Associate Professor - CANCELLED FOR NOW!!! Abstract: From Athens to Zagreb and from Riga to Reykjavik, new political parties are bursting into political life and quickly withering away again, one after the next. Why do these new parties achieve such quick success and then collapse whilst other parties endure? Central Europe, where the rapid rise and fall of parties has become routine, provides answers to these puzzles. Building on nearly two decades studying political parties in the region this project's main goal is to produce a book length study which provides a cogent explanation for the extent, timing and variation in the (in)stability of party politics in the region. Not only does the project offer new measurements of party system change and conceptual innovations such as sub-party systems, it also combines the study of party systems with individual parties themselves and demonstrates the salience of party organization, party appeals and adaptive leadership mechanisms in explaining party success. Moreover, it contributes to broader debates surrounding the state of democracy across the European continent and further afield. Abstract: This talk will feature some of the major contributors (Bill Harris, Robert Jones, Marsha Music & others) in a live panel style discussion of Detroit music from Jazz to Hip Hop based upon M. L. Liebler's #1 selling anthology from the WSU Press Heaven Was Detroit: From Jazz to Hip Hop and Beyond. This anthology is the first of its kind to capture the full spectrum of Detroit popular music from the early 1900s to the twenty-first century. Readers will find in this unique and stimulating anthology new essays, and a few classics, by widely known and respected music writers, critics, and recording artists who weigh in on their careers and experiences in the Detroit music scene, from rock to jazz and everything in between. With a foreword by the acclaimed rock writer Dave Marsh and iconic photos by Leni Sinclair, the book features such well-known writers as Greil Marcus, Jaan Uhelszki, Al Young, Susan Whitall, Gary Graff, John Sinclair, and many others. Critics say that this book "captures the essence of the Detroit music scene: the grit, the spark, the desire to tell a story set to the rhythm of the city." Abstract: The site-responsive work I create with students in Detroit is framed within the theoretical and aesthetic cultures of social practice. Yet, until recently, I had not fully considered the extent to which my work relies upon a set of presuppositions about the relationship between artists and participants which are at least partially informed by anthropology. In this presentation, I will examine various dimensions of the development of a performance created with students at Belle Isle. The performance was designed to explore familiar aspects of the history of the island park, while also endeavoring to to unearth submerged complications in that history. Using Hal Foster's essay "The Artist as Ethnographer" as a critical template through which I might interrogate my own practice, I will discuss various steps of our creative process as a set of convolutions. We reach towards ideas and images that attract us and subsequently turn them over, turn them around, twist them sideways and backwards in order to better understand not only the ideas, images and histories but also the nature of our attraction to them. Abstract: Abstract: Is global capitalism responsible for increasing precarious work around the globe, or is the rise of informal and precarious work a newly emerging trend in the West but a long-standing reality for the rest of the world? This talk enters debates about precarious and informal work using the case of China, and in doing so, challenges our West/Rest binary. It shows how informal work in China is not a new phenomenon, but rather was the norm during China's early industrialization, from 1898 to 1949. Even during the Maoist period, full-time standard employment under the danwei system was a privilege reserved for "urban" workers, in part made possible by a reliance on the rural population as a source of flexible labor. During the contemporary post-Mao period, not only has informal work flourished, so have other new forms of precarious work. However, while scholars of Chinese labor and labor politics have carefully documented the rise of precarious work and its impact on labor politics, informal precarious workers have remained largely invisible and are absent in most analyses. Expanding our framework in a way that includes rather than eliminates these workers from our analysis has significant ramifications for how we understand this historical moment. Abstract: Research in one-on-one private music lesson settings has concluded that children who attain music proficiency regard their teacher's personal qualities and expertise as playing a considerable role in helping them acquire their musical skill (Howe & Sloboda, 1991). Additionally, the ability to motivate students is an important characteristic of a successful private teacher. Children who are the most motivated to participate in music lessons usually have the highest expectations of themselves. (Pitts, Davidson, and McPherson, 2000). This Brown Bag lecture presented by a panel of Wayne State University music professors will discusses advice and current trends in private lesson teaching. Topics will include resources for the private teacher, instructional design, learning styles, motivational strategies, and the business side of teaching. This brown bag will be of interest to those considering and currently teaching in the private lesson setting as well as parents of young musicians. This talk is Co-sponsored with the Music Department. Please note that this lecture will be held at Schaver Music Hall located in Old Main at 11:45am. Abstract: Abstract: In 1969, a group of political activists acquired an old printing press and opened the Detroit Printing Co-op in Southwest Detroit. Among them were Fredy and Lorraine Perlman, founders of Black & Red Press, which would go on to publish the first English translation of Guy Debord's Society of the Spectacle and many other radical books and pamphlets. The purpose of the Printing Co-op was to provide printing access to anyone who needed or wanted to express themselves, specifically for 'non-profit' purposes. Co-op members considered the equipment to be "social property", controlled by individuals who needed and maintained it. Fredy Perlman experimented with the use of color, overprinting, and collage during the decade when the Co-op existed. This talk will provide an overview of a recent exhibition of work made at the Printing Co-op that took place at 9338 Campau, in Hamtramck. How Should Ethicists Respond to Taboo Sexual Interactions? Abstract: How should ethicists respond to taboo sexual interactions? Are all such interactions morally impermissible? If not, what are the conditions under which such interactions are permissible? In this presentation, I argue that some taboo sexual interactions are, in fact, morally permissible. I rely on the assumption that sexual interactions should be judged on the basis of the same moral principles that non-sexual interactions are judged. The most important moral principles when it comes to judging personal interactions are harm and consent. When we apply these principles to sexual interactions, we find that many sexual interactions generally considered to be taboo are actually morally permissible. Next, I respond to an objection that states that this result can be used as a reduction against my preliminary assumption that sexual and non-sexual interactions should be judged on the basis of the same moral principles. Finally, I consider whether ethicists have a duty, on the basis of potential harm, to conceal the permissibility of these taboo sexual interactions. Abstract: When I was young, I received sixteen years of college education (1965-1981) at such low tuition that I earned a debt-free Ph.D. In 1965, a university education was already following the industrialized model that is dominant today: too many compartmentalized classes, too many books, too many tests and too many professors delivering lectures on topics that they very mistakenly assume are intrinsically interesting to too many learners who enter the university almost exclusively to get a degree to get a job. Missing is any methodical instruction on critical thinking and its application to the analysis of the world we live in. Over thirty percent of college grads cannot think any more critically than when they started. Even the Ivy League is producing a generation of "intelligent sheep." The withdrawal of federal and state funds in support of colleges has shifted much of the cost to the private individual learner who graduates with an average debt of $30,000 and dim prospects for a job. This talk will address the twin burdens on learners of the new corporate pay-not-to-learn model that has become the national standard for how we train the minds of the future. Abstract: In the post-war period in the US, those seeking to promote improved conditions in poor neighborhoods have commonly encouraged such communities to pursue one of two strategies: community development, i.e., taking direct action to create physical and economic assets that benefit the neighborhood, or community empowerment, i.e. community organizing to win public policies that benefit the neighborhood. Although these strategies appear to be complementary, with the potential to be mutually reinforcing, they have proven difficult to combine in practice, and their supporters have sometimes been at odds. This presentation will briefly review the history and evolution of the two approaches, including their accomplishments and shortcomings. It will draw on that assessment, and selected examples, to identify two reasons the two approaches have been so rarely combined. First, they require very different organizational capacities and skills, and different types of relationships. Second, winning major policy changes typically requires a broadly based political campaign; such campaigns have been easier to mount in support of people-based policies with broadly shared benefits (like raising the minimum wage) than in support of policies targeted to particular types of places (like neighborhood revitalization) with benefits that are less evenly distributed. Abstract: In this presentation, Professor Kruman will discuss the civic responsibilities of public higher education and examine how the development of "citizenship across the curriculum" can enable universities to fulfill those responsibilities by educating thoughtful, knowledgeable citizens for a lifetime of civic commitment. Current research indicates that the adoption of such a revised curriculum also will have practical results: it will foster improved recruitment, retention, and graduation rates; enhance job skills and strengthen corporate citizenship when those graduates enter the work force. Abstract: In Mexico and in many other countries in Latin America, the 1990s and 2000s witnessed the creation of numerous autonomous state agencies designed (ostensibly) to improve democratic governance. These agencies focus on specific issues (access to information, human rights, elections) and are structurally disaggregated from central ministries as independent administrative authorities. My research asks: Do these new agencies improve governance? Do they help to consolidate or advance democracy? How effective are these agencies in protecting and promoting citizen's rights?! Abstract: The guillotine is a universally known object. Introduced by the French National Assembly not long after the July 1789 Revolution, the guillotine was introduced into use for multiple reasons. It was seen as a social leveler in a society where noble criminals were beheaded while commoners were subject to slow and painful methods of execution. With the guillotine, all French men and women would face equal justice and punishment. But the guillotine also came to symbolize quick, even rushed, justice to many during the Revolution. As the French politics became more radical over the 1790s, the guillotine came to be seen less as an instruments of equality and more as a tool of repressive justice, used to kill scores of French who did not agree with the increasingly radical view of politics supported by Robespierre and his political allies. As France expanded its political influence first through Napoleonic Wars and later by nineteenth century colonialism, the guillotine became a multi-faceted symbol of French rule. It was a device of quick and supposedly humane execution as well as the means of enforcing compliance with the dictates of the French political and criminal justice system. Although its use was abolished in 1977, the guillotine remains a powerful symbol of French power and the system of capital punishment. Abstract: When Chumani Maxwele vandalized the statue of Cecil Rhodes that dominated the main entrance to the University of Cape Town, he sparked protests against colonial statues, plaques, and symbols across South Africa as well as in Great Britain and the United States. Those protests have challenged the continued appropriateness on college campuses of monuments and memorials symbolizing a colonial legacy. Critics of the protest have typically characterized the attention given to symbols as na?ve or misguided?if not a manufactured crisis, certainly no more than a distraction from the goal of decolonizing higher education. In my presentation I argue that subsequent protests and debates fail to recognize the radical potential of Maxwele's initial act. By seeing statues, plaques, and other objects such as paintings as representations of something else, critics and protestors alike participate in a disembodied rhetoric which privileges knowing over doing. As such protestors and their critics miss seeing Maxwele's vandalism of the Rhodes statue less as a challenge to a colonial monument and more as a challenge to the disembodied rhetorical strategies of representation through which monuments impose colonial experiences. In arguing for understanding Maxwele's protest as an embodied challenge to disembodied rhetorical strategies, I make the case that decolonizing universities involves generating alternative strategies of rhetorical embodiment. "Our 18th Century Constitution, Congress, the President, and the Two Party Political System." Abstract: The presentation will discuss how our 18th century Constitution interacts with the two party political system. Particular attention will be paid to the contemporary situation following the 2016 election. Our 18th century constitution embodies 18th century political notions of separation of powers and checks and balances. And it is a constitution that was supposed to operate without political parties. The framers did not contemplate political parties, which they called factions. They assumed that all the leaders of the new government would be men like themselves, generally born to wealth and privilege with a strong sense of public service. But political parties emerged early, coming to the forefront in the election of 1796, and being firmly established in the election of 2000, with the Jeffersonians and the Federalists. The current two party system has been with us since the election of 1860, and is truly a two party political system. In the 30 Presidential elections since 1900, the Republicans have won 16 and the Democrats 14.While the Republican Party is currently in the ascendancy, controlling both Houses and the Presidency, and the clear majority of state houses and governorships, the Democratic Party was in the ascendancy after the 2009 election, and power has shifted between both parties over the years. It is important to note that the American constitutional system begins with the states. The first constitutional document was the Declaration of Independence by which "these thirteen colonies ought to be and hereby are free and independent states." In American constitutional theory, the American states succeeded to the sovereignty over domestic matters formerly exercised by the British crown. This means that state sovereignty is a given in the American constitutional system, and the states do not depend on the federal constitution for the source of their power. Each state has its own system of laws and its own courts - most of the laws that we live under are state laws - and states exercise full sovereignty over domestic matters unless a particular exercise of that sovereignty is restricted by the constitution or is preempted by federal law. In American constitutional theory, there is no such thing as a national interest. The members of Congress are supposed to represent the interests of their districts and the Senators the interests of their states, The national interest then is the sum total of the interests of 435 congressional districts and 50 states. It is with this background that the presentation will explore the powers of Congress, the powers of the Presidency, and the relationship between the branches. And it will do so with reference to the current political situation following the 2016 election. Abstract: Many universities across Central Asia are deeply engaged in significant reform in their higher education systems. This presentation and discussion will present a specific case institutional transformation efforts at the University of the Humanities (UH), Ulaanbaatar, Mongolia. In the context of Mongolia, UH is out in front of the objective of providing the academic and faculty development support necessary to improve the teaching and research capacity of its faculty. This project, supported by the Fulbright Senior Specialist Program of the Council for International Exchange of Scholars, aimed to provide organization assessment support, faculty development expertise, and consultation on teaching and learning for the senior academic leaders and faculty members of the UH. The ultimate goal of this project was to increase the number of more highly qualified teaching faculty at UH. In order to encourage institutional change, it was practical to first address cabinet level officers (i.e., the president, provost, director of human resources, and vice president of operations); second, the senior academic administrators (i.e., deans and chairs); and third, faculty from across departments and schools. This presentation will provide an overview of the project and outcomes. Abstract: What is the "cultural logic" of the millennial condition? This talk will be a report on knowledge gained from my Winter 2016 senior seminar titled "Selfies: The Millennial Condition in Literature and Culture." Who are the millennials; how does this generation accede to a periodizing concept? In the United States, the "millennial" is a site of stereotype, projection, or identification, often intuitive and unreflective; the "millennial" has emerged a cultural clich?, a startup identity visible in the "college + 2, college +5" demographics of culturally creative enclaves like Brooklyn or the Mission District. "Millennials" raise rent; focus on short-term hedonistic goals, confine their world picture to themselves and their friends on social media, affectively map their condition through reiterations of "like," are confused about goals and overwhelmed by student debt, are addicted to binge watching, and employ the selfie as the primary means of self-reflection. This is the view of the millennial I mean to contest, through direct questioning of the products and forms of millennial culture, in the context of senior seminar on millennials, most of whose participants were themselves millennial. In order to the overturn the dominant but now dated culture logic of the present as postmodern, I find millennial culture as accessible in a socially reflexive form of questioning: the materials and methods of my seminar followed, in an open form of collective pedagogy I want to continue to develop as the royal road to the millennial condition, here and now. ! "Trump and the Ethics of Stigma"
"Professional, Personal, Liminal: Media Scholars' use of Social Media for Peer Communication"
Abstract: Despite evidence that households pay more for lots or houses in conservation subdivisions, developers are sometimes reluctant to build them. I use a spatial autoregressive model to shed light on this contradiction. The presence of nearby conservation lots reduces the value of a given conservation lot. I present two possible explanations for this result: 1) Lots located close to each other are indicative of higher density, which is frowned upon by Americans and 2) Conservation lots compete for views and rural aesthetics and the construction of one lot decreases their availability to other lots. Results for other independent variables corroborate these explanations. Developers' reluctance to embrace conservation subdivisions in some locations might be a result of regulations that discourage their development. More research is needed on how regulations for conservation subdivisions vary across the U.S. and how these affect developers' decisions. "Hey, Where are the White Women at? :" The Presentation of Racism and Resistance in Blazing Saddles"
Abstract: In 2000, when the American Film Institute released its "100 Years, 100 Laughs," list ranking of the best American comedies Mel Brooks' Blazing Saddles earned the number six spot. Most of the film analysis of black participation in the film industry during the 1970s focuses on the Blaxploitation movement, and films such as Cotton Comes to Harlem, Sweet Sweetback's Baadasssss Song, Super Fly, and Foxy Brown are typically discussed as important black films that represent the decade. This leaves black-themed films from the 1970s, such as Saddles, Lady Sings the Blues, Sounder, or The Bingo Long Traveling All-Stars and Motor Kings that do not fit neatly into the overly broad category of Blaxploitation lacking in critical attention. This presentation will discuss the ways in which Blazing Saddles calls attention to and mocks stereotypes about black men, how the film plays with the themes of the Blaxploitation movement, and how Brooks uses the quintessential American film genre, the Western, to critique American racism. Abstract: This talk addresses a key question related to sustainable organizing: as sustainability becomes increasingly mainstreamed, what exactly counts as sustainability work? I draw from practice-based, communicative perspectives to "doing" work, to examine how sustainability practitioners make sense of their experiences. The qualitative study has two phases of data collection. In Phase I, I solicited practitioners' personal stories, interviewing 45 participants sourced from professional networking site LinkedIn. Phase II involved collecting and analyzing 35 practitioners' CVs. While participants described a number of activities in their stories and CVs, they tried to distinguish between "actual work" and communicative work. The theme of "actual work" was used to establish that "real" sustainability work was tangible, deliverable and not communicative?which was often treated as greenwashing or immaterial. When participants did describe their work in communicative terms, 9 practices emerged, ranged along a continuum from one-way transmission-based conceptions of communication (i.e., communication as the transfer of information from source to receiver via a channel, sometimes with feedback) to constitutive views (i.e., communication as an ongoing process crucial to meaning-making). These practices were: fact-checking, instructing, preparing plans and reports, selling, translating, performing "thought leadership," networking, engaging in interpersonal dialogue, and facilitating structural dialogue. Abstract: This talk discusses the connection between kinship relations, social support, and gender roles among U.S. immigrant families of various ethnic backgrounds (e.g., Arab American, Caribbean, and Latino). Kinship relations and social support have been shown to have a considerable impact on the social mobility and well-being of immigrants. Findings from both quantitative and qualitative studies suggest that the frequency of family contact and family closeness tends to be associated with both giving and receiving social support. Additionally, women, younger adults, and unmarried persons are more likely to have beneficial extended family networks. Overall, extended family relations tend to contribute to ethnic identities, alternative streams of financial and non-financial support, and upward mobility, as well as, provide some protection against acculturative stress and discrimination in the host nation. However, negative family interactions and collectivist cultural expectations can lessen these benefits, particularly for female immigrants. Abstract: The University of Missouri caught the attention of the nation when students and groups on campus united in response to racial tensions, staging peaceful protests and making demands that set off a series of events, including the resignation of the university's president. Similar protests have taken place across the nation, including the University of Michigan Ann Arbor, Eastern Michigan University, and a number of Ivy League Institutions across the nation. These incidents pose both challenges and opportunities relative to the lives of students from underrepresented groups as they navigate privileged spaces on predominantly white college campuses. 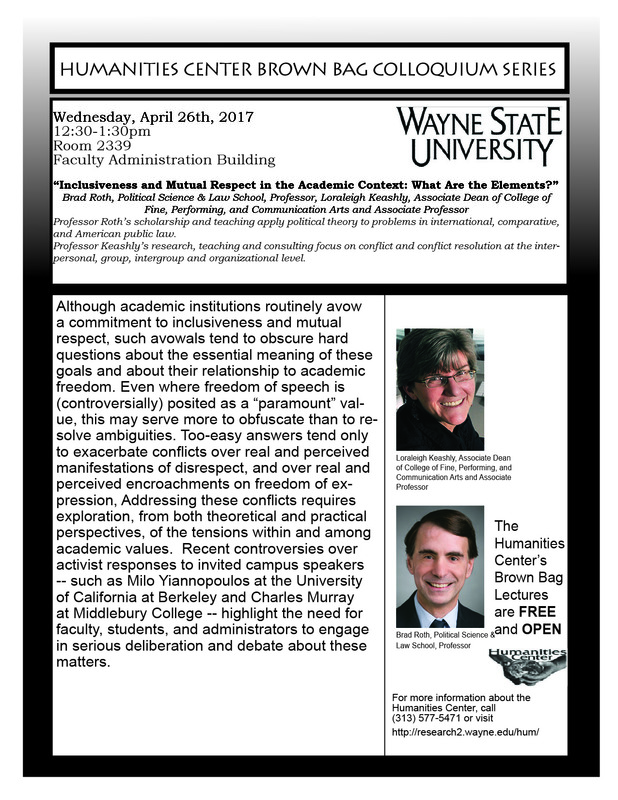 Using the Mizzou incident as a case in study, this research talk will frame the context of the Mizzou crisis using an Alternative Dispute Resolution framework. The authors will also highlight the importance of using a more dialogic model of communication to engage critical discourse around race, privilege and the college experience for students of color. Abstract: The revitalization of Detroit's urban core has invigorated interest to live in these areas of the city. A consequence to this reinvestment has been the displacement of seniors whose low-income housing is being converted to market rate apartments. The redevelopment of a former HUD section 8 building after conversion to market rate housing raises many key questions on the well-being of its residents both after they move in terms of adjustment and changes in their access to healthcare and social services and changes in their social networks, and during the moving process. This presentation will focus on their understandings and reflections of the moving experiences taken from interviews of former residents (n=44) in Detroit, Michigan who were displaced from their building. This study used community based participatory research methods and involved interdisciplinary community partners. The presentation will also include of discussion of intertextuality (or the interweaving of discourses) in interdisciplinary frames. Abstract: Techno music was created in the Black community of Detroit in the early 1980's. It then spreaded around the world to form one of the most powerful cultural movement of the end of the century. I chose to work on the city of Detroit and its Black Techno Music for my PhD in Human Geography at the university of Bordeaux-Montaigne, France two years ago, and I am now spending the year doing research in the African-American studies department of Wayne State. My research aims to re-affirm the link between techno music and the tremendous musical heritage of Detroit. It also deals with the geography of techno music in the city with reflexion around how to map music, and focuses on one particular Detroit techno collective, Underground Resistance. This work finds its theoretical anchorage in several disciplines including radical and feminist geography as well as popular music studies and urban sociology. All these topics will be discussed during the talk with an emphasis on Detroit techno music history. Abstract: Over a three-year period, the Michigan Municipal League provided technical assistance and funding to a group of Michigan cities to help plan and implement placemaking efforts. We surveyed participating communities and a non-participating control group to learn whether the program had an impact on implementation. Although participants did not report a great deal of implementation progress, respondents from participating cities felt overwhelmingly positively about PlacePlans and its impact on local placemaking efforts. They reported many intangible benefits of the planning process. In addition, cities who went through the PlacePlans program reported a stronger relationship beforehand with the League than cities that did not go through the program, and reported an even stronger relationship after going through the program. Abstract: How do news stories know when to invoke the "war on terror"? Give credit to the person or institution that articulates an existential threat to a mutually cherished object in such a way that if we don't rescue it now, there won't be a "we" to rescue it later. According to securitization theory, that threat can be to political or military structures but equally to social and cultural ones. A purported flood of unvetted immigrants from terror-prone states, like having to press 1 for English or endure a smaller car in the name of corporate average fuel economy, suggests that America might never be made great again ? and indeed is slipping from the grasp of those who want to pass such an exceptional America on to their children. Abstract: In Pieces is the exhibition currently on display at the Elaine L. Jacob Gallery on the WSU campus. In this talk, the curator of the exhibition will discuss the concepts that informed the development of the show. The exhibition began as a meditation on technology and how it has affected the ways we think about ourselves. The most common operationalized perception of technology is that it extends human capacities. But what do we make of the ephemera produced (and lost) in the noise of missed signals, disordered representations, and the chaos of ricocheting fragments? What can these temporal and spatial collisions offer us, particularly at the interface of the digital and the mechanical, the alchemical and the telematic? The works selected for the show are designed to bounce off of each other, inviting us to consider how concept moves between fast and slow media, between hard surfaces and soft screens. The weightlessness of light on liquid converses with thirty-five hundred pounds of cement. Abstract: Literature in various social sciences (mainly sociology and educational psychology) document "effects" of education on attitudes. Most of this literature is observational in nature and so we cannot rule out the possibility that people with different attitudes, or perhaps the propensity to develop different attitudes, simply choose to pursue different types or levels of education. In this work, I use a large change in compulsory schooling to isolate the causal effect of education on attitudes. In 1997, compulsory schooling in Turkey increased from 5 to 8 years of schooling. This resulted in a large increase in completed schooling in affected birth cohorts relative to those just a little older than them, as well as an increase in the fraction of the treated cohorts who completed at least 8 years of schooling. I use World Values Survey data from 2001, 2006, and 2011 to examine attitudes in domains including religion, work, family, and gender roles. Abstract: This project investigates a previously unexamined source of international law on armed conflict: resolutions of the United Nations Security Council Since the end of the Cold War, the Security Council has taken action on virtually every new armed conflict NIAC and on many that began prior to 1990. These actions are wide ranging. Each act is embodied in a resolution, which frequently imposes binding legal obligations on parties to the conflicts. The project asks two questions about this now substantial body of Security Council practice. The first is whether the Council has consistently imposed the same obligations over time. In order to answer this question we have created a new dataset that codes all Council resolutions on a list of conflicts ongoing from 1990 to 2013. The resolutions are coded for their imposition of binding obligations on a range of legal issues, from human rights to the law of armed conflict to the permissibility of using force. The data reveals that the Council in fact consistently requires the same acts. More importantly, many of these Council-imposed obligations differ in significant respects from what international law would otherwise require. Second, the project asks whether these patterns of obligations can contribute to or indeed change existing international law. We ask whether they can be assimilated into several categories of traditional legal sources or whether they should properly be viewed as ancillary to the law-making process but nonetheless relevant. Abstract: In his 1935 book The psycho-biology of language, the linguist George Kingsley Zipf introduced the concept of dynamic philology, emphasizing the quantifiable aspects of linguistic sciences, and particularly the observable effects of word and phoneme frequency and minimizing speaker effort, rather than the philologist's concern with the social and cultural contexts of speakers, writers, and their linguistic productions. Unsurprisingly, Zipf's modern impact has been in large-scale statistical analyses of word frequencies in corpus linguistics and psycholinguistics, while many humanists are rightly skeptical of anything calling itself philology that is divorced from social context. The present paper uses the study of numeral systems - a core subject of traditional philology - to propose a different configuration of "dynamic philology". I show how written numerical notations elucidate the numerical cognition of writers and their audiences, while remaining attentive to the social dimension of textual practices. Using a comparative analysis of 'conspicuous computation', the intentional use of unnecessarily large or exaggerated numbers in texts for discursive effect, I show that the violation of 'least effort' principles is symbolically effective. I also show that frequency effects are vitally important for understanding numerical systems ? but not in the ways that Zipf imagined. ! Abstract: We are, as Descartes said, thinking things: things that doubt, affirm, deny, are willing and unwilling, feel love and hatred, imagine, and have sensory perceptions. In this talk, I aim to articulate a metaphysical question about the relationship between a thinker and the individual "thoughts" or mental episodes---the thinkings, doubtings, affirmings, imaginings, sensings and so forth---that make up his or her mental life. I explain how this question differs from two more familiar philosophical problems in its vicinity: the mind?body problem and the problem of personal identity. I lay out the possible kinds of answer to the question about thinkers and their thoughts; sketch a "Humean" answer, inspired by David Hume's chapter "Of personal identity"; and sketch a defense of this answer against some objections. Abstract: Building upon organizational legitimacy theory, this paper investigates public access and commitment to audience diversity as two critically important values that convey moral legitimacy on public service organizations. Using the sample of 335 public and nonprofit cultural organizations located in the Detroit Metropolitan Area, this paper uses the GIS-modelling approach to develop an index of public access that takes into account institutional admissions policy, the physical characteristics of a location, and the availability of, and access to, transportation. The U.S. Census Bureau data is further used to analyze how accessible cultural institutions are to the traditionally underserved populations and multigenerational audiences. Our analysis reveals that cultural institutions are unevenly distributed in the geographic area, and that certain groups of the population are at a greater disadvantage in terms of their access to particular types of cultural amenities. These findings imply that, although legitimacy is seen as an important organizational goal, cultural organizations may be underutilizing an important community resource ? diverse audiences ? that would allow pursuing legitimacy goals in practice. These findings have important implications for overall urban prosperity and the sustainability of the arts and cultural sector itself. Abstract: At Wayne State University (WSU), The Composition Program's mentoring program for new GTAs expands Reid's (2008) and Stenberg's (2005) calls for clearly structured and reflective mentoring programs by cultivating multiple opportunities for teacher training where collaboration occurs between faculty mentors, senior GTA mentors, and new GTAs. In order to establish active engagement between the department, faculty, and GTAs, our program has attempted to develop "third spaces" for both reflective and collaborative community building (Oldenberg 1999). When used for GTA training, third spaces provide both formal and informal instruction where each member's voice, needs, and ideas are at the forefront. They also buffer the transition into a new, and often unfamiliar, academic setting. Finally, third spaces provide a community of learners where old and new members work together towards common goals and expertise. This talk presents the Composition Mentoring Committee's development, implementation, and reflective revision of collaborative and professional peer mentoring between program lecturers, senior GTAs, and new GTAs in our mentoring third spaces. "Immigrant Related Projects and Programs in Federal Empowerment Zones: Comparing Homogenous, Bifurcated and Multiethnic Places". Abstract: Recent scholarship has proposed that urban spatial structure (i.e., homogenous, bifurcated, or multiethnic) shapes the context of reception for immigrants and how local governments incorporate immigrants. Specifically, some scholars have argued that a bifurcated population (e.g., about half Hispanic and half Anglo), would have better policy outcomes for immigrants than a multiethnic population (i.e., no majority), which in turn would have better outcomes than a homogeneously Anglo population. My study uses content analysis of the Clinton Administration's Renewal Communities/Empowerment Zones/Enterprise Communities (RC/EZ/ECs) (n=127), to provide insight. First, I categorize RC/EZ/ECs has having immigrant-related projects or programs. Second, I categorize RC/EZ/ECs by type of spatial structure (i.e., homogenous, bifurcated, multiethnic) using census data. Then I test associations between the two. I find that RC/EZ/ECs with increasing immigrant populations, Hispanic bifurcation, or homogeneously Hispanic were associated with local governments developing immigrant-related projects and programs. Homogeneously Hispanic and bifurcated Hispanic places had better outcomes than multiethnic places. While this research is not generalizable outside the study population, it is consistent with the theory that bifurcated places are more likely to have pro-immigrant outcomes. This research is also consistent with theory in that multiethnic places may not successfully form coalitions for change. Abstract: This talk will focus on the changing roles, responsibilities, and expectations of industrial designers and design researchers working in the private and social sectors. The author will discuss traditional and non-traditional ethnographic approaches and methods in design process, including consumer insights research, participatory design engagements, and long-term fieldwork experiences. Finally, she will discuss the increasingly important role that design anthropology can play in creating designs that are functionally and aesthetically inclusive. Abstract: Violent deaths by gun seem to be escalating. The school shooting at Columbine was an anomaly when it occurred. That is not the case anymore. School shootings occur too frequently. Sandy Hook Elementary was a horrific escalation. Citizens continue to arm themselves with concealed carry permits making it legal to be so armed. In the recent past, a 2 year old child shot his mother in a Walmart with her own legal handgun. The gun violence statistics in Chicago continue to soar. The massacre of innocents in a Charleston church and an Orlando night club only reaffirms that this issue, sadly, continues to be a timely one. There are endless examples of the harm caused by gun violence in the United States. I will present images of my creative work that is made in response to the horror of gun violence and the work of other activist artist who want to keep the questioning of our gun policies in the forefront of our collective consideration. I use high-contrast pictographs, mixing contemporary and ancient symbolism to create patterned and highly ordered works. The carefully chosen symbols are repeated and confined to their respective registers, communing with each other in their juxtaposition to create something similar to a narrative. Abstract: Sociologists have long debated the relative roles of economic capital (e.g., wealth and income) and cultural capital (e.g., parental involvement) for explaining disparities in educational achievement. In this paper, I synthesize these models of educational stratification by presenting a model of resource amplification to clarify the link between family wealth and mathematics achievement. I posit that wealth reinforces the positive impact of concerted cultivation leading it to have a stronger impact on mathematics achievement in wealthier families. I argue that this pattern occurs because parents in high wealth families are able to afford organized a different set of organized activities which leads children in wealthier families develop a sense of their privileged placement in the stratification system. Growth models using data from the National Longitudinal Survey of Youth support this argument and suggest that cultural and material models of educational stratification can be complementary rather than competing. Abstract: As thousands of American GIs poured through the port cities of Le Havre and Marseille in the summer of 1944, they coaxed French cooperation with American politics not only through chocolate bars, cigarettes, and Coca-Cola, but with scores of new jazz hits performed in French caf?s and on American military bases. This paper examines the performance and criticism of jazz in the liberation era of France, arguing that jazz both confronted the French with American dominance and provided inventional resources through which they could resist. French jazz critics writing in the popular periodical Jazz Hot, I argue, denied American claims to superiority by attacking the United States on cultural grounds. Highlighting the role of French musicians in legitimizing jazz worldwide and denouncing American racism, these critics worked to refute American claims to dominance by casting France as culturally and ethically superior. At once a sign of American opulence and strength and a source of immense French pride, jazz offered an ideal prism through which to refract the struggle over national dominance in the wake of France's liberation from Nazi rule. Abstract: This talk explores some puzzles about thought, language, and probability. I have solutions and morals of my own, but mostly just want to raise and talk and think about the problems. Here's an example. Suppose you enter a Total Perspective Vortex that allows you to see everything in the universe. You notice that there are two people just like you in different galaxies (looking into Vortexes). You notice that one has a red star under its hair ("Red"), while the other has a blue star ("Blue"). You've never looked under your own hair, however. Are you Red or Blue? Seems like your opinions could (rationally) be split 50/50 between "I am Red" and "I am Blue". Yet if you are Red, then your thought "I am Red" expresses the seeming triviality that you are you, and your thought "I am Blue" expresses the impossibility that you are someone else. How could you be uncertain about that? In addition, you can know without looking any further, "If I am Red, then I have a red star on my head". Yet whoever you are, it is perfectly possible for you to have had a blue star (or no star) on your head. Inclusiveness and Mutual Respect in the Academic Context: "What are the elements?" Abstract: Although academic institutions routinely avow a commitment to inclusiveness and mutual respect, such avowals tend to obscure hard questions about the essential meaning of these goals and about their relationship to academic freedom. Even where freedom of speech is (controversially) posited as a “paramount” value, this may serve more to obfuscate than to resolve ambiguities. Too-easy answers tend only to exacerbate conflicts over real and perceived manifestations of disrespect, and over real and perceived encroachments on freedom of expression, Addressing these conflicts requires exploration, from both theoretical and practical perspectives, of the tensions within and among academic values. Recent controversies over activist responses to invited campus speakers -- such as Milo Yiannopoulos at the University of California at Berkeley and Charles Murray at Middlebury College -- highlight the need for faculty, students, and administrators to engage in serious deliberation and debate about these matters. Abstract: The 2016 Presidential election has once again pushed the issue of immigration to the forefront of public opinion. Various scholars and political pundits have pondered whether racism, specifically towards Hispanics, plays the greatest role in shaping oppositional perceptions towards immigration. Whites have been the overwhelming focus of this debate in both media and scholarship. The current study looks at the impact of immigrant competition on the perceptions of five different US race groups as it pertains to immigration preferences. In doing so, it helps us to more comprehensively understand how economic concerns shape public opinion despite race and when combined with race.